This innovative new product manufactured in Northern Ireland provides safe all round protection for loads transported on pallets. It is easily assembled in just a couple of minutes and protects merchandise up to a maximum payload of 1 tonne. This allows users to reduce the risk of damaging property in transit or injuring employees whilst increasing the efficiency of the companies logistics. 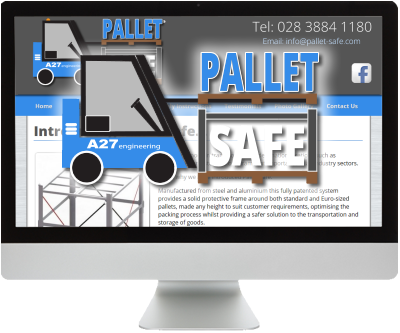 We designed a fresh website for Pallet Safe to display the product, assembly instructions and testimonials from customers already using the product. Social media links are included as well as an interactive jQuery slideshow and photo gallery. Visit the website today at www.pallet-safe.com.